Welcome to the Snowcastle Games Press Area! In the press kit you will find everything you need to know about our company and our current project, EARTHLOCK. We've also provided an assortment of product artwork and company logos that are at your disposal for blogs, magazines or any other form of press you desire. Scroll down this page to find our latest press coverage. If there is anything else you need, please contact our Press Team and we'll get it to you right away! Subscribe to our press mailing list! Earthlock Review: Enhancements and Additions Oh My! The best part is, playing it on Switch allows you to take Earthlock with you on the go, or enjoy it on your TV. Either way, it looks stunning and allows you to see new cutscenes and story content that did not come in the original release. This is truly a brand new game, despite it feeling familiar. There is so much to love, and aside from it being grindy in places (which, what RPG isn’t really?) I think it is truly a fantastic game. This is a game that needs to be experienced and is exactly what I look for in a classic style RPG. I was very surprised at the changes they made, and I look forward to the recently announced Earthlock sequel. "...Picking up my Wii U again to play on Earthlock was definitely one of the better gaming choices that I have made recently. Although the console may be fading into the background with the rise of the Nintendo Switch, Earthlock is making sure the Wii U gets an amazing send off with its addictive style of gameplay. With what can only be described as a beautiful artistic style of character design, environments and even enemies there is little room to doubt that Snow Castle games have created a truly immersive experience." The world of Umbra is colorful and filled with a unique cast of characters, all working together to provide a unique experience that only Earthlock: Festival of Magic can conjure up." "...Earthlock: Festival of Magic is difficult. However, it is also wonderful, fun, and every bit as polished and charming as AAA developed JRPG’s. I can’t help but keep going back to comparing it to games like the Tales series, due to the mixture of strategy, puzzles, and polished yet challenging combat. Overall I think Earthlock: Festival of Magic is a must-buy for RPG fans. " "...The mechanics are strange, quirky, and interesting (not to mention different than what most RPG fans are used to) but Earthlock: Festival of Magic is worth every hour you will spend farming, crafting, fighting, and unraveling the tale within the game." "...Earthlock: Festival of Magic is a turn-based RPG that’s releasing on PlayStation 4 on 27th January. While its foundations lie in the classic stylings of the genre, it’s been moulded to take advantage of modern trends to feel contemporary. Lead artist Fredrik Dahl from Snowcastle Games talked us through the juxtaposition of the revered and new that makes Earthlock an interesting proposition for RPG fans." "...It’s built by turn based RPG fans for fans: “When we sat down and had a round table after we finished up our previous production [interactive children’s story app Hogworld: Gnart’s Adventure], it quickly became clear that we all had fond memories of turn-based RPGs. " A New IP is Born! "Earthlock: Festival of Magic is what a Kickstarter-funded game is meant to be. After years in development, Snowcastle Games delivered a quality RPG title to rival popular RPG games today. As a fan of RPG games but one who does not play them as often as I used to, Festival of Magic offered a variety of adventure, missions, & whimsical humor that reminded me so much of old school Squaresoft games. NOT SquareEnix but Square-SOFT! " "...Snowcastle Games crafted a beautiful throw-back to old RPG favorites while updating the feel with crisp, clean graphics that handles quite a lot of action on-screen at times. Character & enemy details on good while the backgrounds, towns, battlegrounds, and overworld shine with nostalgic goodness." "...Initially, a gamer could finish the game within 30 hours conceivably but after near 50 hours myself, I can attest there is just enough added in-game fun to extend the hours beyond 30 hours. For the price of the game, the quality & quantity ratio is very good." "...This is the first game that delivered on its promise to its backers and feels like the company and IP have a future in the gaming world. I have high hopes for a sequel as the original Kickstarter promised this to be only Chapter 1 of a 3-part series. If that is the case, this initial IP for Snowcastle Games is primed to grow larger and show more of the mysterious world of Umbra." "Earthlock: Festival of Magic from Snowcastle Games is an absolute nostalgic joy to play. 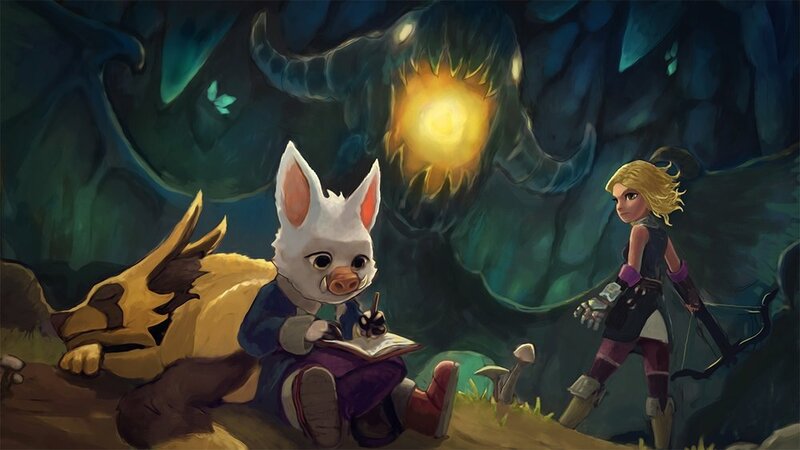 Feeling at once both reverential for classic 16-bit JRPGs and novel due to its western stylized setting and systems, Earthlock is a grand start to an RPG trilogy, and well worth the meager price of admission." "...I will say that Earthlock’s difficulty curve is just about right too. Most battles are simple “trash” fights aimed at leveling you up. But as soon as the first main boss in the Swamp you’ll find out that the combat can be really trying but not punishing. The story’s solid, the characters are likeable, and the pacing is just right." "...If you like the gameplay of the 90s titles that made Final Fantasy, Breath of Fire, and more household names, but always wanted something with a more western aesthetic you’ll find plenty to love in Earthlock: Festival of Magic." "...Earthlock is a fantastic throwback to the JRPGs of the 90s. Its turn-based content is brusquely paced, strategic, and also novel with the stances and pairing mechanics. You get your own home island you can farm and build up, and each of the game’s core six companions can be customized with talents to change how they play fundamentally. It all comes together exquisitely for JRPG fans, but with a western veneer." "...Earthlock sits up there with some of the best JRPGs I’ve played in recent years." "This game has it all in my opinion. Good story, cool backdrops, towns, and dungeons a very good battle system and fully customisable players that you find along the way. " "... it’s a lot like FFVII in the layout of the game, just very polished compared to it." "...the artwork, the gameplay, the battle system I love it all! "...It’s what Final Fantasy needs to get back to"
I love this game! I have missed these kinds of games and I would play them all the time if they were still about as much as they used to be, but every now and then a little gem like this appears and it’s great. The last game I played like this was Child of Light. Earthlock: Festival of Magic marks the glorious return of the heartfelt, story-driven, turn-based JRPG; The kind of game we haven't seen since the era of Lords of the Rings: The Third Age and Final Fantasy X. "Whilst it is certainly less dark and more child-friendly than its predecessors, it nonetheless captures the spirit of danger, adventure and of burgeoning relationships which made those classic titles memorable." "... As I played Earthlock… I realised there was something special about this game. ‘Charm’ is a good word for it; ‘character’ is another. It draws you into its world despite how much I wanted to write it off as another re-tread." "... I think it is a tremendous achievement and one that you can easily lose yourself in for hours on end, and one that you will certainly feel a burning curiosity to get to the end of once you commit. Perhaps the best way to put it, is developers Snowcastle Games have created a game I could get nostalgic about now." Earthlock: Festival of Magic is a beautiful homage to classic JRPG style games like Final Fantasy and Chrono Trigger. "... [Snowcastle] has produced an incredible aesthetic that leaves us wanting to explore more and more." If there’s any game you’re going to get this month, make it this. "... Earthlock is a good game, everything feels polished, it has a well written story, it’s pretty and plays really well." "...This game has balanced its difficulty well, it’s hard – if you don’t know your enemy and just use the same move combination over and over you’re not going to survive. Taking the time to vary your attacks and discovering each creature’s weakness is key. This can turn an impossible boss battle into something strategic and enjoyable." "... The first thing you notice when you start the game is how good it looks. ... Do not expect photorealistic graphics, but a beautiful, colorful world with an atmosphere reminiscent of Final Fantasy X." "... An indie title that approaches the quality of a triple-A game." "... a compelling adventure that will stay with you long after completion. If you don’t pick this up while it is free, you’re looking to spend about $30 / £20, and even then, it will be worth every bit of cash you invest. It’s stunning, captivating, plays on its own strengths and despite not giving you many hints as to where you should be heading, it is utterly entertaining. Fans of JRPG should most certainly be adding this to the download queue." "... Earthlock uses the unity game engine to admirable effect, it’s got the typical JRPG styling down to a tee, with subtle touches of Max and The Brotherhood it’s a very eye pleasing combination..."
"If your an Xbox player there is absolutely no reason not to pick this up, it really is a rough diamond." "... with a healthy dose of creativity and imagination you don’t have to have a hundred million dollar budget to produce an amazing game. We spent countless hours engrossed in Earthlock: Festival of Magic and we’re still convinced that we’ve only scratched the surface of this wonderful game.."
"Earthlock: Festival of Magic is an essential purchase. And the fact that it’s a free game on Xbox Gold for September means there’s absolutely no reason to miss out on this great game. Highly recommended." "... it hits all the right notes and provides a wonderfully charming experience throughout. There are enough unique additions on top of all the classic staples that it didn't feel like a cheap imitation, but a true JRPG that can stand on its own. Earthlock: Festival of Magic is out tomorrow. Give it a try."